Just because you’re a ’90s baby doesn’t mean you shouldn’t brush up on your pop-culture history. The Root is here for you. In a new weekly feature called Cheat Sheet: Everything You Need to Know About, The Root will celebrate the anniversary of a major event in pop culture and make sure you know why it mattered. Everything you need to know about: New Edition’s All for Love, released this week, 30 years ago, in 1985. Why All for Love matters: New Edition’s third release came at a time when group member Bobby Brown was beginning to feel creatively stifled by the group’s sweet-and-innocent persona. So while touring to promote the album, Brown began singing over lead singer Ralph Tresvant on several songs. Then, when it came to the group’s classy, Motown-esque choreography, Brown began flipping the script and gyrating onstage instead. Before the tour was over, Brown was kicked out of the group and they finished out the tour as a quartet. But is this album really essential for you to know? Well, yes and no. This wasn’t New Edition’s greatest work. But without All for Love, there would be no solo Bobby Brown. And without a solo Bobby Brown, there would be no bad-boy R&B prototype. That means no K-Ci from Jodeci. That means no Jaheim. That means no Chris Brown. Bobby Brown invented and perfected the R&B-singer-with-edge. And it might not have happened if not for this album leading to his getting the boot. 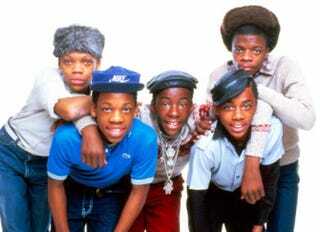 Report card: As New Edition albums go, All for Love gets a solid B-plus. (Their best work? Their self-titled sophomore album.) And as ’80s R&B in general goes, it gets knocked down to just a B. * Beyoncé’s “Love on Top” features choreography influenced by New Edition. Aliya S. King, a native of East Orange, N.J., is the author of two novels and three nonfiction books, including the New York Times best-seller Keep the Faith, written with recording artist Faith Evans. She lives with her husband and two daughters in New Jersey. Find her on Twitter and at aliyasking.com.